Dr Brian Cahill is Project Manager of the Train@Ed MSCA COFUND project at the Institute for Academic Development of the University of Edinburgh. He studied Mechanical Engineering in Ireland and moved to Germany in 1998 to take up a position with Hewlett Packard. He received his PhD for work in electrokinetically-driven fluid flow from the ETH Zurich in 2004 and subsequently carried out postdoctoral research in colloid and interface science at the University of Geneva. 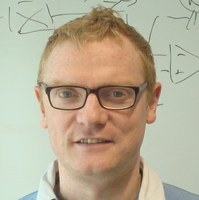 He was a Marie Curie fellow and Junior Research Group Leader in the field of droplet-based microfluidics at the Institute for Bioprocessing and Analytical Measurement Techniques in Heilbad Heiligenstadt. He is a Member of the Governing Board of EuroScience and was Chair of the Marie Curie Alumni Association from March 2016 to February 2018.